In yet another alternate universe, Ben had started to glumly contemplate his fate. He could fall out of a universe easily enough – and had enough skill with the force to steer himself to universes where he could survive long enough to get out even if he didn’t hit a planet straight off – but his subconscious was just interfering way too much. He’d been blaming Jacob for his problems, and had promptly arrived in a universe where Jacob had wrecked the Republic AND the Sith territories. Now he was depressed. Oh NO. Now he was wondering how much worse this could get! Once he started to think about THAT… He’d be a hybrid flying dutchman! Wandering from universe to ever-worse universe, thinking about how it might get worse, until he wound up in some sort of inescapable hell where the force bound everything together so much that he’d NEVER be able to break away! He went to get a drink. And perhaps to get very VERY drunk. We waited silently while dangling from the ceiling as the Republic military bunch went chasing after Jacob through the tunnels underneath the Jedi Temple. I wasn’t about to use my Force sense until I had a better idea of their intentions towards the rest of us. About all I was able to tell was that the vibrations and noise caused by all that crashing around was becoming fainter and that likely meant it was becoming more distant. Finally I judged it to be reasonably safe to drop to the floor again, let go of Alys and Lazlo, and open the door. Looking around, I could see that the little chase scene had done a number on the walls, with cracked or bent panels all over the place. Droids were busily sterilizing the places where containment of the vampiric space moss had been broken, so no need to worry about that. I really didn’t need a vampiric plague running loose around Coruscant because of Jacob. Thank the Force for the small miracles in life. Alys and I then began looking for a computer terminal to hack into for any clues on the Republic Codifiers that might be had. Hopefully we could use some of the Faded hacking modules I made copies of to break in and learn something valuable or interesting regarding these guys. We finally found a remote terminal hookup hidden amongst the racks of computer equipment and Alys was busily hooking into it when a number of alarms started going off around us. (Kira) What did we trip some sort of protection system? (Alys) No, it’s external to this system. Looks to be coming from the main Temple system itself. (Kira) What sort of alarm is it? (Alys) I’m getting some sort of intruder alert. Looks like the Jedi Temple is under attack. (Alys) Bounty Hunters storming the main lobby and several over entrances. Also looks like a heavy Sith paramilitary group under the foundations trying to come up. And finally we have a number of unseen individuals done in one of the service tunnels just underneath the surface. We started comparing precognition and probability analysis results against each other. It was obvious who the Bounty Hunters were primarily after (and what had set it off; Jacob’s blazing exit from the temple, which had amounted to a giant flare announcing “Now is the time!”). We figured the bunch underneath the foundations were also going to be trying to push their way towards the storage rooms for looting whatever they could find before trashing the place. The unseen group in the tunnels was a bit harder to determine other than their intent on killing everyone in the building. Well crap. I was hoping for a more singular threat to focus on than this. Bounty Hunters were little more than annoying in anything other than overwhelming numbers or when equipped with really heavy weaponry, and these close quarters weren’t going to favor the really big weapons anyway. Plus they had no real good way to locate me without searching much of the temple. That left the unknown group and the looters. Unknown people with the objective of killing everything they could find was definitely the bigger threat, but without more information on who they were and how they planned to accomplish this, anything I could do would be just as bait/decoy. Besides, there were a large number of bounty hunters that were going to resist being killed most violently. If I was lucky, the two problems might take care of themselves. Right, I am not going to be making much of a dent in the Bounty Hunters without a lot of time and help, and going after the unknowns wasn’t going to be productive without more information, so it was time to go hunt some looters I think. (Kira) Alys, see what you can do to organize what defenders we have, and then we need to get all the tourists evacuated if possible. In the meantime, I am going to see what I can do about some of the Sith running around the place. Alys grunted in assent. She didn’t see to be happy about the idea of once again organizing things, but it wasn’t like I had any real skill with that beyond proposing various plans. I left her and Lazlo behind as I went off through the corridors looking for a way down. Quickly enough I found myself back outside the Force shielding and reconnected to the Galaxy. Valerie immediately came over the link as I took off at a silent run through the halls. She’d never heard of a Sith Politician, and didn’t want to be the first! This mess was going to be ugly enough without that! <Valerie> Ah so you did come back on your own. Care to explain that one? <Kira> Looks like vampiric space moss paneling on the walls blocks the Force. <Kira> Also interesting is the fact that the Jedi Chief of Security for the Temple is also a hybrid like us. <Valerie> That’s just disturbing in the implications. <Kira> You’re telling me. Does it look like the authorities have caught on to a disturbance in the Jedi Temple yet? <Valerie> They’re efficient enough to have gotten there in force before the ruckus even started. It’s also all over the news that you’re involved in this. <Kira> How did the news pick up on my presence? Is the Republic Military trying to pin this fiasco on me to justify a coup or something? <Valerie> You’ll note that I offered to take care of the problem for you not that long ago. <Kira> I didn’t say anything. <Valerie> And I know you better than that. <Kira> Let’s just say that Jacob better get offworld or be found by the Jedi, because if the Republic or I find him first, it isn’t going to be pretty. At that point I made it to an elevator to go further down into the Temple basement. I was about to phase through the door so that I might simply fall down the shaft to the bottom, but then the elevator arrived. Unfortunately, the door opened to reveal ten war droids. (Droid) There he is! Open fire! Pulling out my lightsabers and leaping back, I blocked the blasts that were going to hit me as I sensed for the keeper of these droids. I sensed he was in the elevator car that was about to arrive a few seconds from now in the adjacent elevator shaft. Looks like he had sent the initial batch of droids up ahead of him to draw fire and clear out the way. Alright, best to take out these droids then before he arrives. Stepping into Hypertime, it was a simple matter to ramp up my timerate until I vastly outpaced the droids. At which point it became a simple matter to just pick apart the droids faster than they could react. That still left me with a number of droids and it looked like two bounty hunters set to arrive in the next elevator in a few moments. Oh well, the bounty hunters were of secondary importance right now. The various Sith were the primary concern and the bounty hunters would neatly act as a distraction for them. I walked into the waiting elevator car the droids arrived in and phased through the floor. I could hear the two bounty hunters disembark there own car and begin shouting at each other as they found the remains of all their droids. While falling it was another simple matter to adjust my timerate such that I was gently falling to the bottom of the shaft instead of quickly plummeting at terminal velocity. Since my goal was the bottom level, I landed onto the bottom of the shaft with all the fine grace of microgravity and phased through the next door. 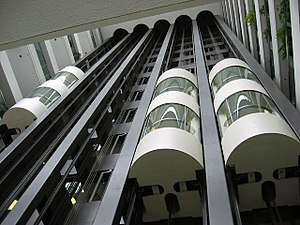 As I re-entered the normal timestream, I could hear the sounds of crunching metal and concrete behind me as my massive inertial impact damaged the elevator shaft. An unfortunately bit of property damage the Jedi could bill me for, but I think they might be willing to forgive me considering the number of Sith I am likely to be dealing with. I found what I was looking for soon enough as I spotted a service shaft extending through the foundation below. The hatch itself was open and I could see a pair of soldiers standing watch as it sounded like more of their friends were quickly climbing the ladder to join them. Conveniently both of them had a belt of thermal detonators on them. Since all evidence pointed to these guys not being with the Republic, it was a simple matter to make a noise at the other end of the hall from me to distract them. One went off to investigate, while the other continued to stand watch over the hatch. Stepping lightly but quickly, I slipped behind him and sliced off the belt of thermal detonators with one of my knives. He immediately turned to look at me in shock as I handed him one of his thermal detonators back and pushed him down the hatch. (Kira) Here, hold this for me would you? By that point the thermal detonator was already primed and counting down. As he fell staring at me in shock and horror, I telekinetically closed the lid on the hatch and spun the locking mechanism tight. The other soldier came running back at that point. He pointed his rifle at me and started demanding answers as to what I thought I was doing. At which point the thermal detonator exploded below us as the floor shook violently for a moment and the hatch groaned mightily. I was anticipating the tremble, but the soldier wasn’t. So I was able to close the distance, grab him, and slam his helmet into the wall until he fell unconscious. I took his blaster and thermal detonators after making sure he would remain unconscious for a least a few more hours. Reaching out with my senses, I would gather that I got at least one Sith with that blast and maybe a second one. Then the building shook violently and rhythmically. Oh crap, had I just severely damaged the foundation with that thermal detonator? I didn’t think those had sufficient output to do that kind of structural damage. Wait a minute, that rumbling was coming from above and I was now suddenly detecting a massively powerful Dark Side user near the top of the Temple. About the same time I felt something very odd happen to the local dimensional structure as I suddenly detected a lot more people and a fair number of Sith appear out of nowhere in the Temple. What in the hell was going on? Bens experience at the bar had been ordinary enough – although the bartender looked kind of familiar somehow. Still, it was a big multiverse. A LOT of people looked kind of familiar. It had gradually become apparent though that the bar was really popular because it was the only one that still got new, live, shows and offworld channels. Wait, how could that possibly work? Then he got a message from someone called “Vi” – from home. It didn’t take long for Ben to figure it out! The bartender was the analog of that bouncer – the one with the monotalent that let him see into other universes. The aberrant signals that had made him pick this bar – and all those live transmissions – were coming from other universes. He had a link to home! There was a good deal of confused discussion with his would-be “student” before he decided to make a desperate attempt… He opened himself up to the multiverse, reached out to the rest of the bar (and, inadvertently, to the rest of the people in the temple – who desperately wanted to escape the catastrophe their world had become) and shifted. He accidently pulled everyone in the temple – including an army of Jacob-clones and their support systems – with himself. The room was suddenly really crowded. Meanwhile, some distance from the Jedi Temple in a pub, Valerie Soung was watching the news with some amusement. Xiang had, eventually, decided to follow the rest of them to Coruscant. With her head back together – at least somewhat – she’d spent some time upgrading her amulets some more, and then had taken a ship for Coruscant. Being able to afford her own custom ships was really kind of nice. She could get used to that! The authorities hadn’t given her much of any trouble at all. She’d behaved herself in customs, and was – after all – a citizen of Coruscant in good standing, even if she was listed as being a bit psychologically unstable due to grief. Yes, she’d been associating with Kira Keldav a bit – which led to a basic debriefing – but she had no major weapons along, no particular crimes on her record, and not too much information to share. That had been easy. The visit to the memorial to the collapse that had killed everyone she had ever known was a lot harder. After that, she’d felt seriously in need of some distraction. She’d gone to look for the others, and had arrived in time for Jacob’s dramatic exit. That was… not good. The presence of Republic Fleet Admiral Ramith (the one in charge of the Coruscant Sector) – on the GROUND no less – definitely indicated that something was up, but he wasn’t pleased to see her – and his bodyguards tried to stop her. After she bounced a few shots and crushed a heavy blaster against her forehead (detonating the power cell in a massive blast) without being harmed, he didn’t see any convenient way to stop her. She headed in with the bounty hunters. <Kira> Valerie, I am kind of busy right now. <Valerie> Why do the Sith target Alderaan as opposed to Coruscant? <Kira> Are you really asking this now? <Valerie> Because Chan Naldor keeps his stuff on Coruscant! <Kira> Valerie, are you really reciting Chan Naldor jokes now? <Valerie> Can you guess where the news is saying Chan Naldor has shown up? <Kira> You can’t be serious! <Valerie> Don’t worry, Chan Naldor could accidentally kill every Sith in the sector when he sneezes. Too bad he never sneezes. As if this whole debacle couldn’t get any more ridiculous. Now we had a pop culture icon showing up hoping to prove just how bad he is. Here I am in the middle of one of the most chaotic and potentially disastrous battles in the war against the Yeveetha, with bounty hunters, Sith, and Republic military forces trying to get me, and my Bondmate is sitting in a pub flirting with the patron sitting next to her at the bar. <Valerie> Hey, I am not flirting with this idiot. If he wants to buy my food and drink, that’s his prerogative. <Valerie> Don’t sigh at me. We both know it is far more important for me not to be in the middle of that mess right now in case you need an escape option. <Valerie> Don’t talk back to me! Besides, I am trying to be somewhere private enough I can watch the comings and goings of the people around me while still being public enough that I can be sure most of the people around me aren’t Republic Codifiers. Things had suddenly gotten a lot more complicated in the span of a few seconds and I have no clue why. Well, I probably had a good idea of why Chan Naldor was here, but the rest of these people that just suddenly arrived was another matter. Precognition and Assessing Odds was giving me almost complete and utter nonsense about planetary panic, clone armies of Jacob, Zandaras’s victory over the Republic, and Sith saving the Galaxy. Best to check in with Alys and see if she had any clue what was going on. I had my commlink call her. As soon as the commlink connected, I thought a mistake had been made as it sounded like a droid speaking binary to me. It took a few moments to verify that the commlink was connected to the right place, then I figured out the beeping was coming from the swear filter. I wonder how that got turned on? I am going to have to work on that PDA system Ban had installed I think. Blasted thing was probably being overly sensitive with the filtering or something. I found the appropriate setting and turned off the filter. Only to get a loud earful as I suddenly heard Alys swearing harder than any sailor I had met in the Republic Navy. I just stood there in awe for several moments as I listened to the straight laced noble unleash a string of profanity as bad as any of those college animation holos I used to watch. I was pleased to see that the commlink was kind enough to be recording this call for posterity. (Kira) Whoa, whoa, whoa there Alys! It took a moment to suppress the urge to respond to her using that tone with me. (Kira) Alys, you do know that with all the media surrounding this place, there is a good chance that your language is being plastered on the news for your parents to hear? (Kira) Right, now what is going on? Where did all these people come from? Then followed the explanation from her that Ben had apparently decided now was as good a time as any to bring everyone in the Jedi Temple from an alternate Coruscant here. This included the Sith that had conquered the place, and the clone army of bioweapon Jacob’s that the Sith had hoped to use to conquer the planet back from the Yeveetha. Plus all the survivors still left hiding in the Jedi Temple and an ongoing broadcast of highlights of the Yeveetha conquest of Coruscant that had been serving as a distress beacon of sorts. This on top of Xiang apparently deciding to show up and fight Chan Naldor on top of the Jedi Temple. Right, next time I see Ben, I am going to smack him. While this made things a logistics nightmare, it still didn’t change the priorities very much. Yes, Alys needed to get the droids installing Force Shielding around the Jacob clones, but that was what droids were for. And this only added to the number of people that needed to be evacuated from the building as opposed to fundamentally changing the plan. Plus it just added more Sith to the list of people that needed blown up. No problem, there are plenty of explosives in my possession right now and the Sith can’t readily track me.